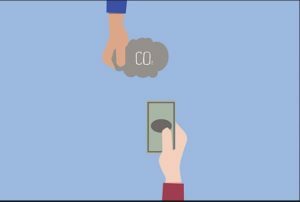 The term refers to a way of putting a price on the use of carbon dioxide (CO2) emitting products (e.g., gasoline) or activities (driving fossil fuel vehicles). The pricing mechanism is a tax that should be set high enough to discourage consumers and businesses from using fossil fuels which are high in CO2 emissions and encourage the use of alternative CO2 free sources of energy, e.g., wind or solar. While a carbon tax is the most common form of pricing the use of fossil fuels, a tax can also be applied more broadly to all greenhouse gas (GHG) emissions, including e.g., methane. The carbon tax is favored by many companies and economists as the most efficient pricing tool, as compared to a cap-and-trade system. Whereas a cap-and-trade system requires an entire new bureaucratic system to design, implement and enforce, employing a carbon tax can often make use of existing taxing authorities. Determine what carbon taxes, if any, apply in the Republic of Ireland and Northern Ireland. Is a carbon tax a fair system for discouraging use of fossil fuels? Should any such carbon taxes be increased or extended to cover other products or activities. Should taxes be imposed on other greenhouse gases (GHGs), for example to agriculture?